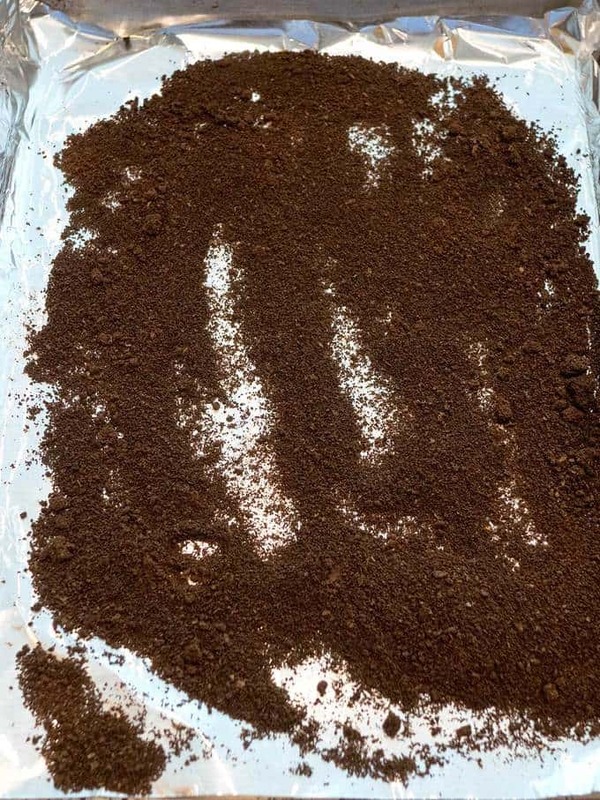 If you do much baking with chocolate, you probably know that many recipes call for a small amount of espresso powder. The reason is that a bit of espresso powder significantly enhances the chocolate flavor in cakes, brownies, etc., without causing your treat to have a mocha flavor. You probably also know that it’s difficult to find espresso powder. If you do find it, be prepared for “sticker shock.” It’s not only expensive, but also comes in much larger quantities than you’ll probably need. 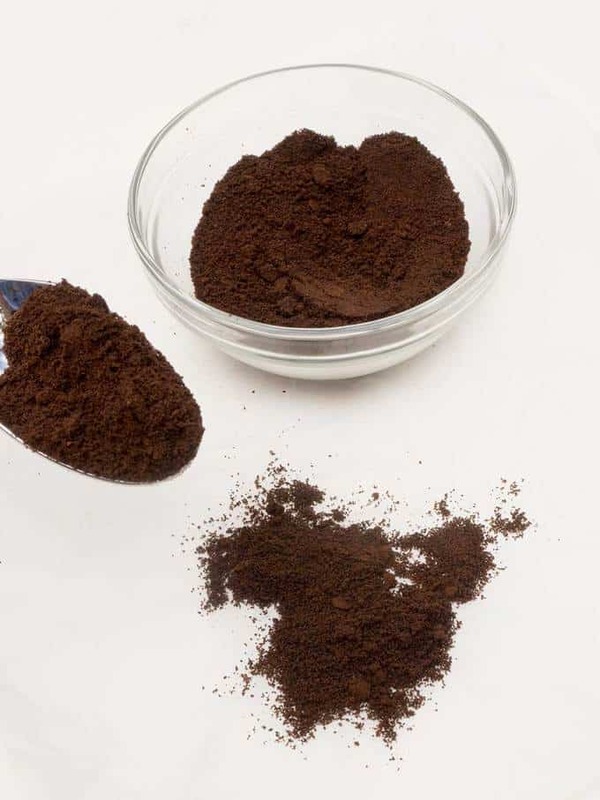 According to the King Arthur site, espresso powder is made from ground, brewed, and dried coffee beans. Therefore, I figured that if I brewed coffee, then I could make espresso powder from the leftover grounds! Seriously? Yes – it worked like a charm! Here’s what I did. First, I spread the leftover coffee grounds on a baking sheet. Then I put them in my oven set to the lowest temperature possible, which was 170° F. The key here is that I wanted to dry out the grounds, not roast them. 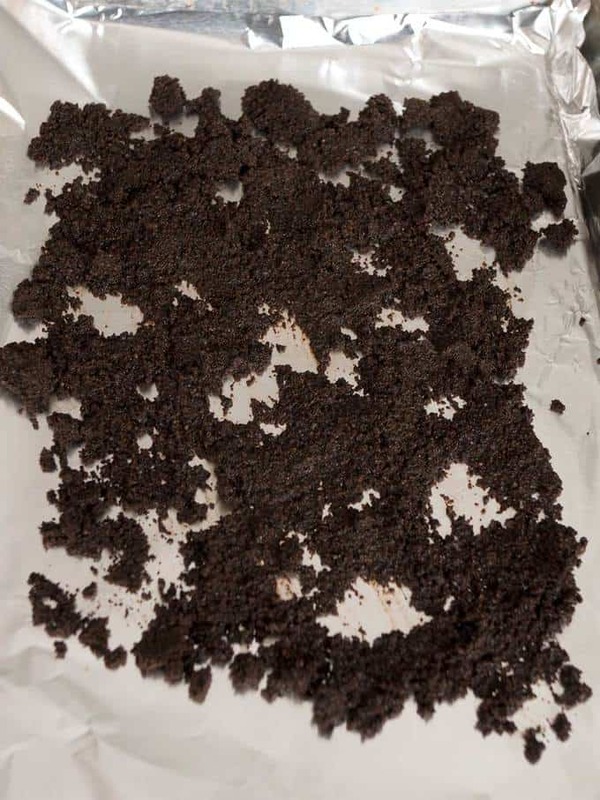 Anyway, I left the coffee grounds in the oven for several hours, until they dried out and felt slightly crunchy. After two hours, the grounds were dried out, but still not crunchy. It took me another 30 minutes before the grounds felt crunchy. Next, I put the dried out grounds in a coffee grinder, and ground them until I had a fine powder. If I hadn’t had a coffee grinder, I probably could have used a blender, a food processor, or a mortar and pestle. I ended up with homemade espresso powder that was perfect in my chocolate masterpiece (stay tuned!). Yum! Spread used coffee grounds on foil lined baking sheet. Bake for 2 to 3 hours until grounds are dry and slightly crunchy. 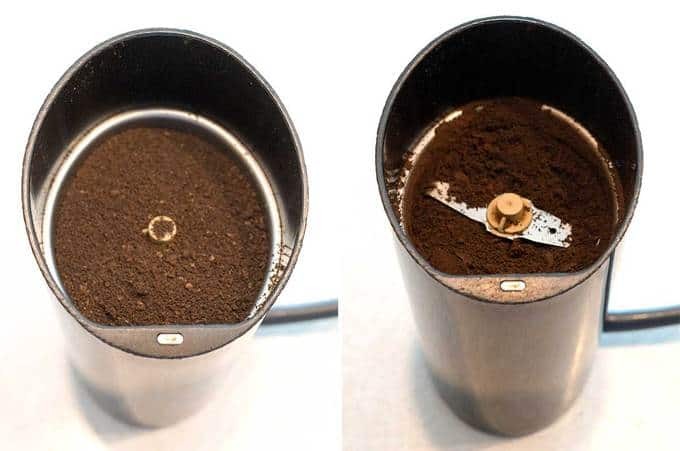 Transfer to coffee grinder, and process to a fine powder. Yield: Depends on the amount of coffee grounds you start with. First!No, but seriously, great tip you've got here. I had to go through an accelerated educational process this morning as to what the heck 'espresso powder' really is. There's quite a bit of less than accurate information on the out there. I'd run into a DIY recipe almost identical to this one just before landing here, this one having a bit more detail. And yeah, 'sticker shock" is what I'd say, too. Holy #$!!@. It's $4.00/0z or more from what I found so far with the priciest batch at William Sonoma and the in-house brand priced at $7.14/oz. Being I purchase, roast and brew my own coffee beans as it is, seems your recipe here's a no-brainier. The real (taste) test will be when my first ever attempted fudgey, whole wheat brownies get created,Thanks for the money saving and hopefully flavor enhancing tip! Let me know how the fudgey whole wheat brownies turn out! I've had great success with my chocolate recipes using this technique. Hi Chula,On second thought, this process here as it relates to and affects recipes, namely ones calling for 'Espresso Powder" is not ideal as I just found out. 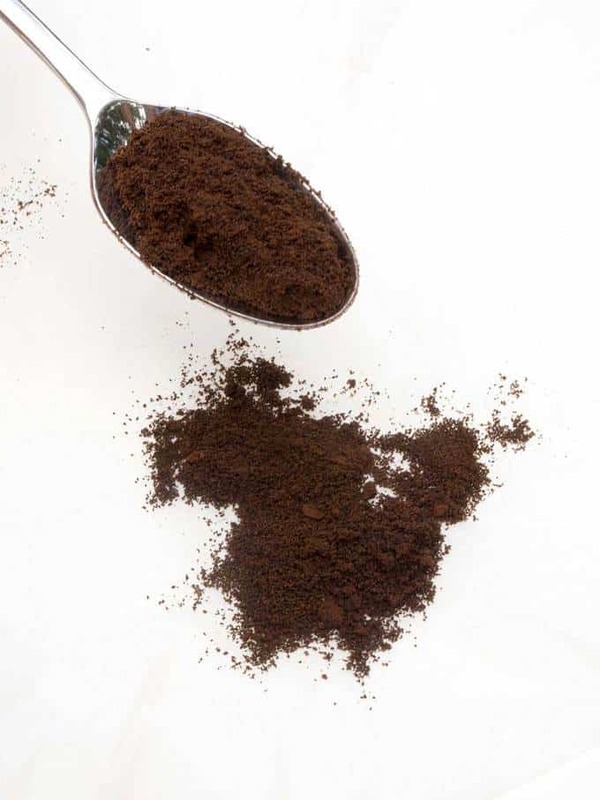 Espresso powder (I know only because I Googled it :) ) is not simply finely ground dark roasted coffee grounds, be they brewed or not. 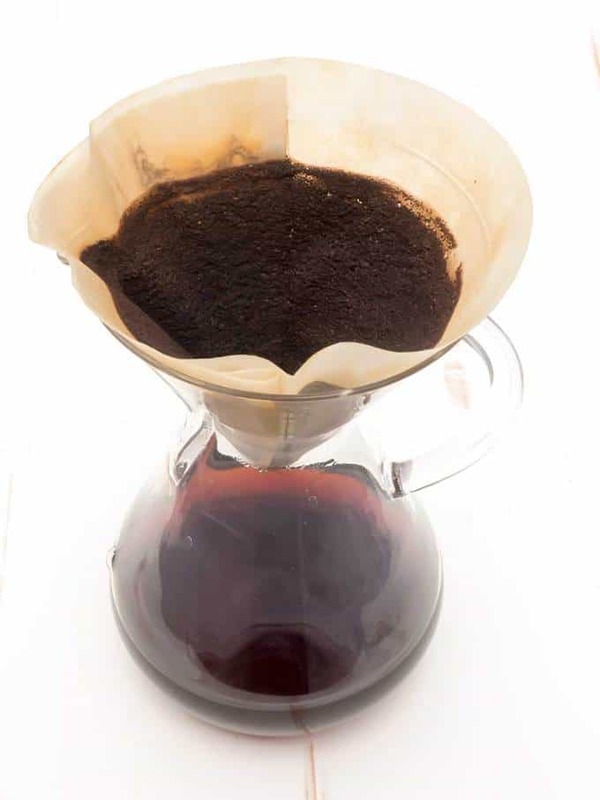 It has to do with a process by which the powder that's created is fully soluble and retains most of the beans original flavor and intensity; that's something 'used' coffee grounds can not duplicate on either count. That said however, your technique here still has to add a little something at a minimum I would think, right?In case your interested, here's where part of my 'enlightenment' was found : https://www.thekitchn.com/food-science-how-is-instant-co-69158 Yeah, it describes instant coffee but when it comes down to it, that's what that overly pricey 'espresso powder' is. Thanks David! I agree that the real espresso powder is overly pricey especially when you just need a teaspoon here and there for a recipe.